A favorite North Indian main course eaten with naan or roti. . Recently i had my cousin cook this for us. The extra love to his recipe was the use of nutmeg powder and here's my take on the dish very much inspired by him. Take a small pan with the ghee and heat. Add whole cumin seeds,cloves, bay leaf, cinnamon stick , cardamoms. Let the cumin splutter, remove from heat. Take a deep bigger pan now and add onions, garlic , ginger and chillies - saute on high heat till brown and caramelized.Mix nutmeg powder. Add the small pan whole masala to the bigger pan.Now to the bigger pan add the cubed tomatoes , mix and simmer. After 5-10 mins , add ketchup. Now add rest of the spices. Mix and cook for 10-12 minutes till a film of oil surfaces adding a sprinkle of water in between if needed. 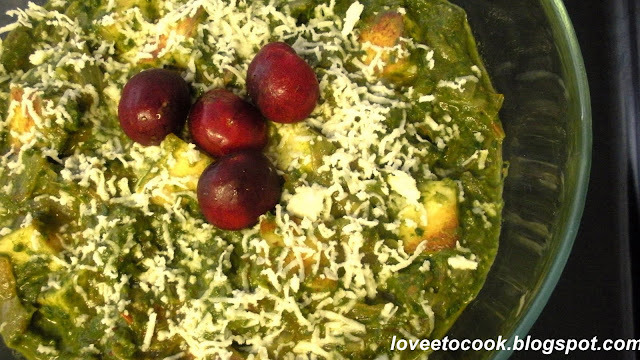 Mix cooked grounded spinach and sauteed cottage cheese pieces. Add half and half cream and mix. Cook till a boil and remove from heat. Add lemon juice. And vala, the dish is done. Fragrant and worth the effort. Yum. Tip : To keep spinach or any other vegetable green -- make sure as the chlorophyll cooks , the carbon dioxide filled steam so created either escapes the pot by keeping the lid open or u blanch in loads of salted water ( 1oz of salt per 4 cups of water) as the salt creates a wall around the spinach and thus stops the carbon dioxide from interacting with the vegetable.